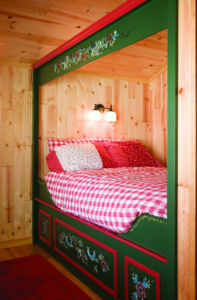 This beautiful guesthouse was featured in the January 2007 issue of Northern Home & Cottage. We’re sharing it again—it’s far too lovely to be forgotten. Read every issue of Northern Home & Cottage online, free. When young Madelyn, Maggie and Mabel Yount visit their grandparents, Jay and Kathie Price, they see a blonde-tressed princess riding a great white bear, a little old man asleep in a horn, a troll awaiting passersby, and a golden castle hovering on the horizon. 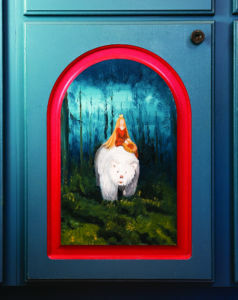 The scenes, lifted from Norwegian folk tales, are painted on the kitchen cupboards in their grandparents’ guesthouse in Lake City, a small town in Missaukee County’s pine-covered countryside. The small, two-story building is designed to look like a stabbur, the traditional Norwegian outbuilding used for a pantry and sometimes as quarters for overflow guests. 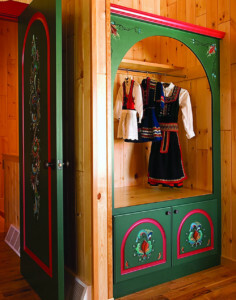 The Prices’ stabbur is as authentic as they could make it, right down to the built-in beds decorated with the Norwegian folk art of rosemaling (translation: flower painting). The couple’s fascination with Nordic culture is a family matter—in the 19th century, Kathie’s Danish and Norwegian ancestors settled in the village of Lucas, 10 miles from Lake City. When the Prices were planning to build a guesthouse several years ago, they decided they’d try to replicate a stabbur. “We thought how cool to just pick up on this unique Norwegian building and adapt it a little bit and make it a little larger,” Jay says. Just before Christmas in 2004 the Prices toured Norway, taking note along the way of any stabburs they saw. They were even invited to a Norwegian family’s home for lunch—an occasion that included a peek inside the stabbur. The Prices returned from Norway infatuated with the country’s snowy landscape and the way Norwegians light up their dark, Nordic nights with twinkling white lights outside and lively colors inside. They were more determined than ever to make their stabbur as authentic as they could. Two years later, the two-story log building is tucked at the edge of the pines in the Price backyard. Three cantilevered sides—called galleries—on the upper story lend the structure the signature top-heavy stabbur shape. A Norwegian flag flies next to the front door, and a matched pair of wood cutouts of dragon heads threaten away evil spirits from their mounts on the front and back gables. The Prices did make some concessions to practicality. The exterior is half-log over a stick-built frame, not the traditional Norwegian full log laft. They also weren’t able to find a stain as dark as the creosote color of traditional laft stabburs. And while they’d originally wanted red-clad windows similar to ones they’d seen in Norway, the price of custom-clad windows made them reconsider. Andersen stock, green-clad casement windows proved the perfect solution. Paired with red-painted trim, they speak Norwegian just fine—an accent that gets even more fluent on the building’s inside, thanks to a visit by Tove Ness, a Norwegian who specializes in the traditional folk art of rosemaling. 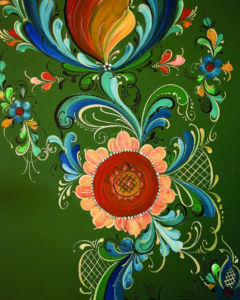 Norwegians use the art lavishly—covering dishes and doors, cupboards and furniture with the swirling, colorful floras. Although the folk painting dates to the 17th century, Price found out about Ness the modern way: on Google. After discovering Ness’s website, the Prices purchased some of her pieces by mail. They liked them so much that they invited Ness to come to Michigan and rosemal their stabbur. Her visit a year ago turned into something of a cultural exchange. Among other jaunts, the Prices took Ness shopping in Cadillac and to a home-cooking eatery in Falmouth, which, because it was hunting season, was jammed with hunters clad in their neon orange. She liked both places. In return, Ness left their stabbur covered in the vibrant blues, greens, yellows and reds of Norwegian folk art. 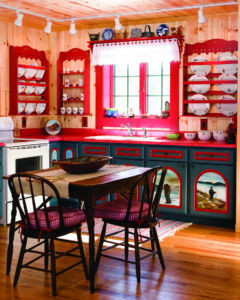 And the special treat—especially for the three towheaded sisters who became her buddies while she was in the United States—those kitchen cupboards fit for little girls’ dreams.